What Is DA Form 5500? DA Form 5500, Body Fat Content Worksheet (Male) is a U.S. Military form for recording the percentage of body fat of a male service member. This form is used during the Army Weight Control Program to record the progress of the soldier. A separate DA Form 5501, Body Fat Content Worksheet (Female) is used for female participants of the program. 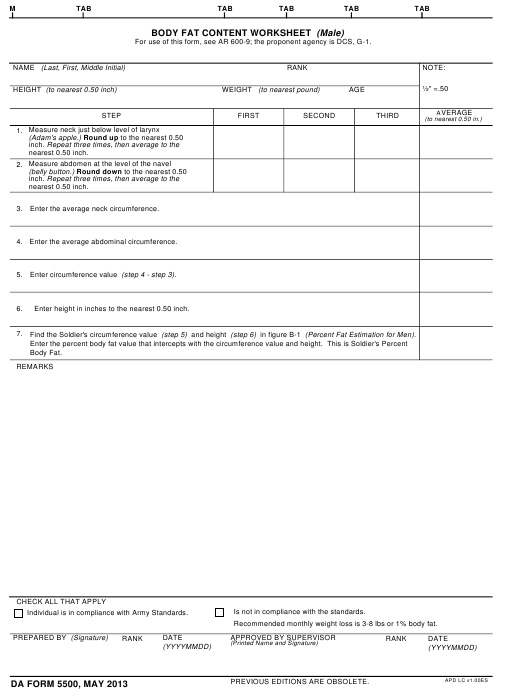 This form, previously known as the DA Form 5500-R and often mistaken for the DD Form 5500, was revised by the Department of the Army (DA) in May 2013. An up-to-date fillable DA Form 5500 is available for download and digital filing below or can be found on the Army Publishing Directorate website. How To Fill Out Da Form 5500? Enter circumference value (step 4 - step 3). Enter height in inches to the nearest 0.50 inch. Find the Soldier's circumference value (step 5) and height (step 6) in figure B-1 (Percent Fat Estimation for Men). Individual is in compliance with Army Standards. Recommended monthly weight loss is 3-8 lbs or 1% body fat. Detailed DA Form 5500 instructions and filing guidelines can be found in the Army Regulation 600-9, The Army Body Composition Program, released in June 2013. Prior to filling this form the designated personnel should receive training instructions on performing proper measurements and have sufficient practical training. First, fill in the service member's personal information: their name, age, and rank. Measure the height and weight and record all of the results. Measure the soldiers' abdomen around the navel and the neck below the Adam's' apple three times and record each try. After all of the tests are complete, calculate the average result for each measurement and record it. Calculate the circumference value, which is equal to the average abdomen circumference minus the average neck circumference value. Enter the soldiers' height and calculate the body fat percentage. To do so, find the height and circumference value in the chart provided within the Form DA 5500. Add additional remarks - if any - in the box provided below the values. Provide the name and rank of the person taking the measurements and sign the form. The last step is submitting the filled-out and signed to a supervisor.